How to Get Rid of Dandruff Permanently? Dandruff is a very common scalp problem which is flaking of dead cells on the scalp. It can happen because of dry skin, eczema, psoriasis, fungus or some skin problem known as seborrheic dermatitis. More than 50% of the people suffer from dandruff after post-pubertal age irrespective of their gender and race. Follow below home remedies to remove dandruff fast without any side effects. Dandruff is not a contagious or serious problem but it is embarrassing and can cause irritation or itching. There are so many cosmetic products are available in the market and they are full of chemical which can have side effects. It is very difficult to know what exactly causes dandruff but it can occur because of the following reasons. Symptoms of dandruff are very simple and easy to spot. It appears as oily white flakes of dead or dry skin which spread on your hair and shoulders. Other symptoms of dandruff can be itching and irritation on the scalp. Dandruff problem can be worse in winter and fell. Dandruff known as cradle cap can affect babies under 5. Mainly it affects newborn babies which cause a crusty scalp and dry skin. This type of dandruff is not serious and clear ups its own. Coconut and honey is a very effective home remedy to eliminate dandruff. It helps to moisturize dry skin and remove dandruff due to its anti-fungal properties. Where honey has antibacterial properties and good natural herb to remove dandruff. Take 2 teaspoons of each coconut oil, olive oil, honey, and 3 teaspoons yogurt and make a thick paste by mixing them. Apply this paste on your scalp and massage it from roots to tip of your hairs. Massage your hair with this mixture for 10-15 minutes and leave it there for another 30 minutes. After 30 minutes wash your hair with shampoo and dry your hair. Apply some coconut oil after using this home remedy. 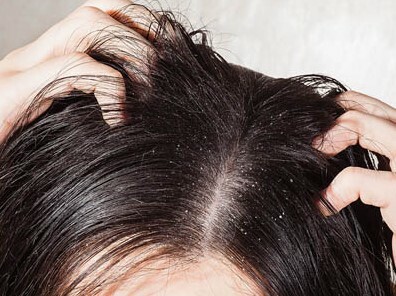 Do this remedy for a couple of times in a week until you get rid of dandruff. You can also massage your hair with a mixture of coconut oil and lemon juice. Take 2 teaspoons of coconut oil and one teaspoon of lemon juice. Mix them well and massage your hair for 30 minutes with it. Wash your hair with herbal shampoo and apply some coconut oil. Read: How to Get Thicker Hair Naturally? Aspirin has salicylates which help to cure dandruff by the exfoliating scalp. To get rid of dandruff permanently use aspirin while you having a bath. Take two tablets of aspirin and mix with shampoo. Then wash your hair with this mixture and leave it for 3-4 minutes then rinse off your hair with water. You can use shampoo to remove mixture from your head. You can also massage with aspirin by mixing it with one teaspoon of vinegar. Leave it on your scalp for 30 minutes and then wash your hair with shampoo. Another wonderful home remedy for dandruff cure. Baking soda has antifungal properties and helps to remove dead cells and stop dandruff due to fungus. Massage your wet hair with baking soda. Leave it there for 5 minutes and then wash your hair with warm water. Apply baking soda twice in a week. Take 3 teaspoons of lemon juice and baking soda and bowl of apple cider vinegar. Mix them well in a bowl and apply on your scalp. Leave it there for 10 minutes and wash your hair with warm water. You can do this remedy just before taking bath. Neem is also known as Indian lilac which has antibacterial and antifungal properties that help to cure dandruff. Olive oil helps to moisturize your dry scalp. Take a handful of dried Neem leaves and crush them into powder. Mix this powder with 4 tablespoons of olive oil. Apply this mixture on your scalp and leave it for an hour. Then use shampoo to wash your hair. Repeat this remedy 2-3 times in a week. Alternatively, you can boil neem leaves in water. Strain this mixture and wash your hair with it. Repeat this remedy four times in a week. Another wonderful home remedy to get rid of dandruff in one wash. Vinegar has anti fungal and bacterial properties which help to remove dandruff. It also removes dead cells from the scalp. Instead of apple cider vinegar, you can use white vinegar. Take one banana and 2 cups of apple cider vinegar. Crushed banana and add vinegar make into a paste. Apply this paste on your scalp from root to tip of the hair. Leave this paste on your scalp for 25 minutes and then wash your hair with herbal shampoo. Repeat this remedy 2-3 times in a week. Banana is a good source of vitamin B which helps to remove to maintain your skin health. You can mix one cup of white vinegar with 2 cups of water. Apply this mixture on your hair and leave it for 5 minutes. Wash your hair with herbal shampoo and apply conditioner. When you look for a permanent solution for dandruff cure, tea tree oil is one of them. It can help you to get rid of dandruff for a long time. It has antifungal properties which help to remove dandruff and also cure itching and irritation. Take one tablespoon of tea tree oil and one cup of warm water. Now mix them in a squirt bottle and shake well. Once you did shampoo then spray this mixture on your hair and massage thoroughly. Leave it there for few minutes then remove the extra moisture with a towel. Make sure you don’t wash your hair for next 12 hours. Aloe vera is very effective Ayurvedic home remedy for dandruff treatment. It helps to remove the dead cell from scalp which reduces dandruff quickly. Apply aloe vera gel on your hair for 15 minutes before washing your hair. You can wash your hair with normal shampoo or with ayurvedic shampoo to get rid of dandruff. Check Out: How to Prevent Hair Loss After Pregnancy? This ayurvedic herb has anti-seborrheic properties which help to control dandruff. Cedar wood also has a soothing effect that stops itching and other skin problems. You need to take 10 drops of each cedarwood oil, cypress oil, juniper oil, and 50ml carrier oil. Mix all the essential oil in bowl or bottle then massage your hair with it. Let it be there for 1 hour then wash your hair with shampoo and warm water. You can use this remedy 3-4 times in a week and before taking bath. Egg yolk is a well-known home remedy for dandruff and hair fall control. It is a good source of biotin vitamin which helps to remove dandruff and also contain protein which makes your hair stronger. Take two egg yolk and apply on your hair. Leave it there for one hour then wash your hair with shampoo. You can wash your hair twice to remove the smell of egg yolk. Repeat this remedy twice in a week to get the fast result. You can also apply egg oil before going to bed and wash it off in the morning while having a bath. It will help you cure dandruff instantly. Egg oil is a good source of omega-3 fatty acids which improve the health of your skin and make hair follicles stronger. Henna is the best dandruff treatment at home which remove dead cell and stop itching. This natural herb is widely used for hair problem, including dandruff. It has conditioner like properties which make your hair stronger. Take two tablespoons of each henna, tea powder, lemon juice, amla powder and coconut oil. Mix them well and make a thick paste. Apply this mixture on your hair from root to tips of the hair. Leave it there for 15 minutes and then wash it off with herbal shampoo. 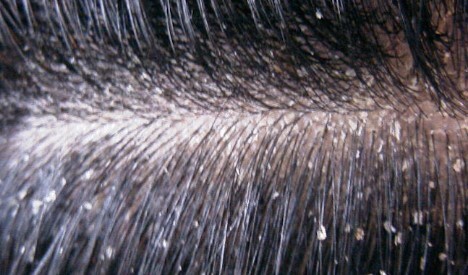 Dandruff can occur because of many reasons. Follow the below tips to reduce the chances of having it. Make sure your hair brush is clean. You can clean it with vinegar. Always use a small toothed comb to comb your hair. Do not dry your hair with a hair dryer at high heat. Always dry your hair at low heat. Use conditioner to make your hair moisturize. You should maintain your diet because the lack of nutrients can affect your hair. While swimming always wears a swimming cap. Don scratch your head often. Do not use anti-dandruff shampoo daily. Avoid washing your hair with hot water daily. Always cover your hair while traveling. Use more herbal and ayurvedic hair product to prevent Dandruff.